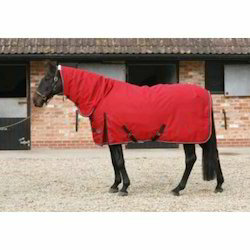 We are ranked amongst the foremost firm that is engaged in manufacturing, exporting and supplying a wide range of Horse Turnout Blanket. 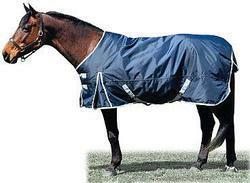 These blankets are designed using quality approved fabric and latest machinery. 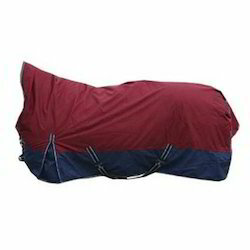 These high quality blankets are offered in various sizes and adjustable webbing legs straps due to which these are highly demanded in the market. 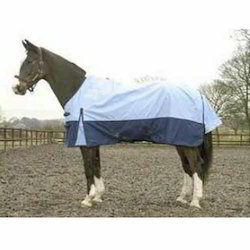 Our offered blankets are tested by our quality controllers on different parameters to ensure its flawlessness. Size Available: 5'0" to 7'0"
Plain Solid Colors and 2-tone color combinations available as required. 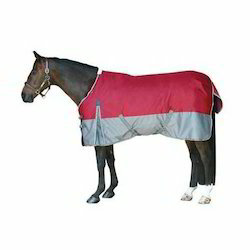 Winter Turnout Blanket are also available in 1200dn Bre/WP Ripstop outer. We accept orders in various quantites as per your requiremens ranging from 50pcs, 100pcs to 500pcs and more....higher the quantity we can quote you better prices. Kindly mail us your trade queries and we will get back to you ASAP. We accept orders in various quantites as per your requirements ranging from 50pcs, 100pcs to 500pcs and more....higher the quantity we can quote you better prices. Zinc buckle chest closures with heavy duty Zinc clip closures in front for easy on and off. Adjustable and removable webbing leg straps with heavy duty zinc clips. Velcro flap closures on neck. This rug comes with great commitment with respect to quality standards. Since the outer fabric is very much stronger then many other 1200dn available in market. Secondly the metal hardware are 100% rust free, since they are made from either zinc alloy or stainless steel material which is completly rust free. 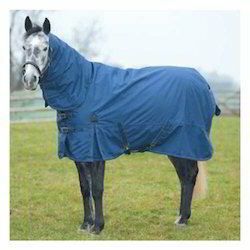 Though expensive from regular turnout blanket, these offer a extra edge then most of its counter part rugs available even branded ones. Kindly mail us your trade related queries and we will get back to you ASAP. 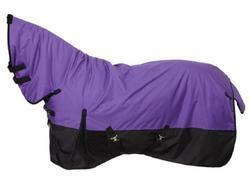 Highly acclaimed for its excellence,with take the pride to present to you a supreme quality Horse Turnout Blanket. Manufactured with high quality primal material and machinery, it leaves no space for defect and gives you full valve for money. Offered to you in the different specifications to satisfy your demand, the quality check before delivery by our adherent professionals makes it available to you flawless. Twin Buckle closures wth velcro. 3 Dee rings for neck attachment. We accept orders in various quantities as per your requirements ranging from 50pcs, 100pcs to 500pcs and more....Prices negotiable over the order quantity. Mail us your trade queries, we will revert ASAP. We accept orders in various quantities as per your requirements ranging from 50pcs, 100pcs to 500pcs and more....higher the quantity we can quote you better prices. We accept orders in various quantities as per your requirements ranging from 100pcs, 200pcs to 500pcs and more....higher the quantity we can quote you better prices. Please do mail us for trade enquiries. We can offer very competitive pricing in the Industry. For higher MOQ like 500pcs and above we can quote better prices. Focusing on quality and its durability we leave no space for error, making it illustrious. We offer it in an excellent range to meet your need and demands at an affordable price after a rigorous check of quality by our highly qualified professional, we zest to deliver it flawless. 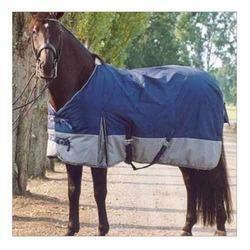 Winter Hick Neck Blankets are available in 1200dn Ripstop Wp and Breathable. We accept orders in various quantities as per your requirements ranging from 50pcs, 100pcs to 500pcs, 2000pcs and more....for higher quantities we can always quote highly competitive prices. We accept orders in various quantities as per your requirements ranging from 200pcs, 500pcs to 1000pcs and more....higher the quantity we can quote you better prices. Adjustable and removable webbing leg straps with heavy zinc clips.